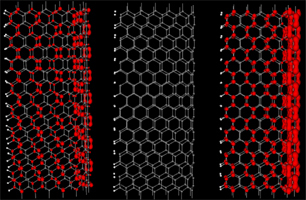 By applying the density-functional theory and non-equilibrium Green’s function method, we have studied the electronic transport properties of folded armchair-edged graphene nanoribbon junctions. The results show that the bandgap of armchair-edged graphene nanoribbon junction is reduced obviously when it is folded. The current characteristics of folded armchair-edged graphene nanoribbon junction are different from that of the monolayer armchair-edged graphene nanoribbon junction. Moreover, it is found that the weak vertical compression on the edge will enlarge its bandgap and block the electronic transport as compared with uncompressed folded armchair-edged graphene nanoribbon junction. However, the stronger vertical compression on the edge will reduce its bandgap completely. These results mean that the electronic transport properties of folded armchair-edged graphene nanoribbon junction are sensitive to the compression on the edge. This phenomenon is very useful for future nanoscale switching device.